Whenever people think of HomeKit accessories, their minds probably first turn to lights and sockets —those are two of the most common household needs after all, and some of the most affordable ways of making a home "smart." The HomeKit platform is capable of plenty more though, including tasks related to heating and cooling. 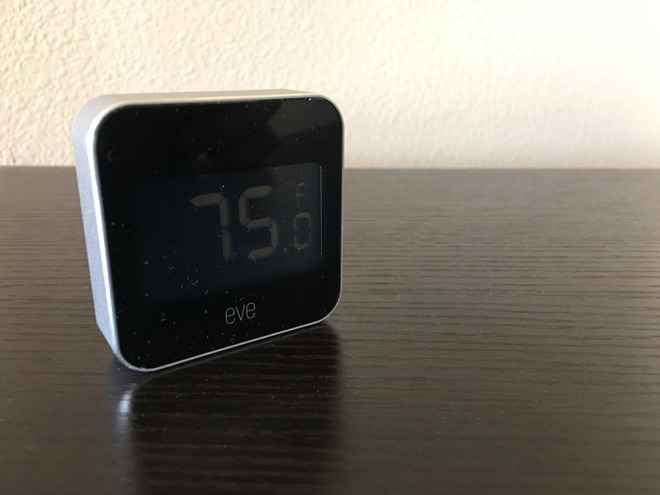 Enter the Eve Degree, which displays the temperature and humidity of any room it's put in, or outdoor weather if it's mounted on a balcony, deck, or window. Setup is extremely easy, at least for people who know their way around iOS. After hitting a button on the back to turn the Degree on, the next step is to go into the Eve iOS app and add a new accessory. After scanning the device's HomeKit code, choosing a room, and auto-detecting elevation, it's ready to go. Temperature can be set to display in Celsius or Fahrenheit. In terms of placement, the device can either be sat on a flat surface or mounted on a wall, thanks to a small slot on the back. The unit is IPX3 water resistant —which should guard against light rain or splashing, but not torrential downpours or accidental drops in the tub. It's also best not to leave outside in snowy weather, since it can only handle temperatures down to 0 Fahrenheit (-18 Celsius). 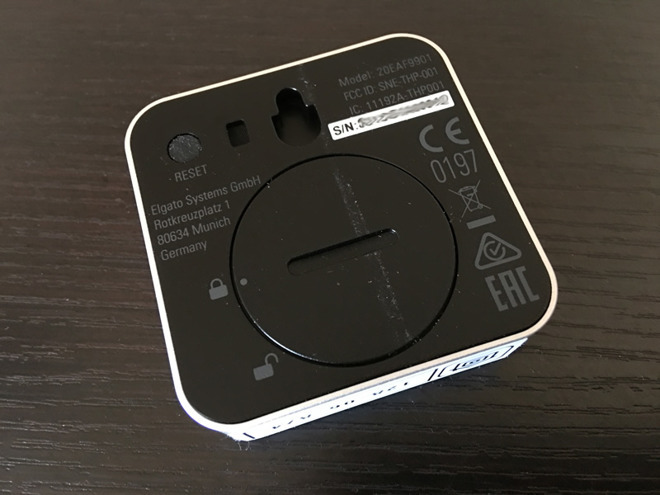 Power comes from a watch-style CR2450 battery, which Elgato claims should last up to a year before it has to be swapped out. 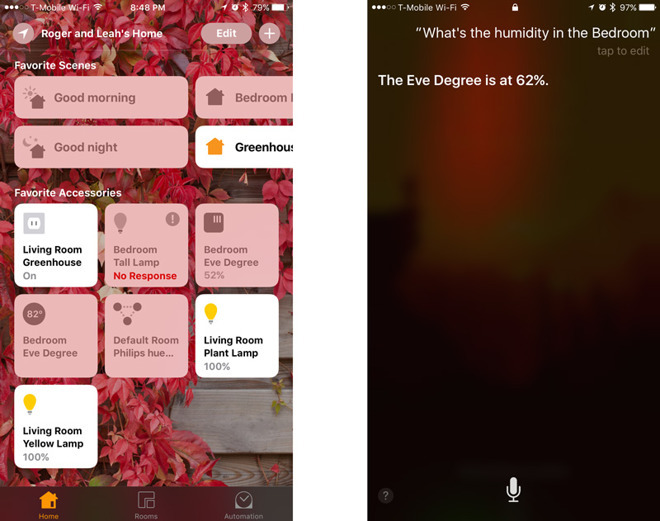 The device's HomeKit support means that separate temperature and humidity tiles will appear in the iOS 10 Home app, and that owners can ask Siri about that data from any of their linked Apple devices. It's worth noting that because the Degree relies on Bluetooth Low-Energy, access away from home requires having an Apple TV or iPad configured as a HomeKit hub, which may limit its usefulness for some people. A hub is also needed to take advantage of automation. 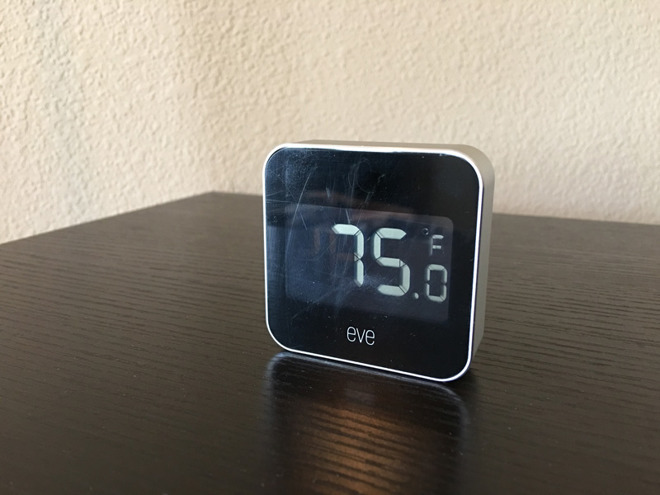 People who have fans, humidifers, or other devices linked into HomeKit can create Scenes that trigger based on the Degree's readouts —if an office's temperature hits 76 Fahrenheit, for example, a ceiling fan can turn on. For wealthier shoppers who are all-in on HomeKit, the Degree may be a useful addition to a setup, helping to keep tabs on a house and make sure every living thing is comfortable. 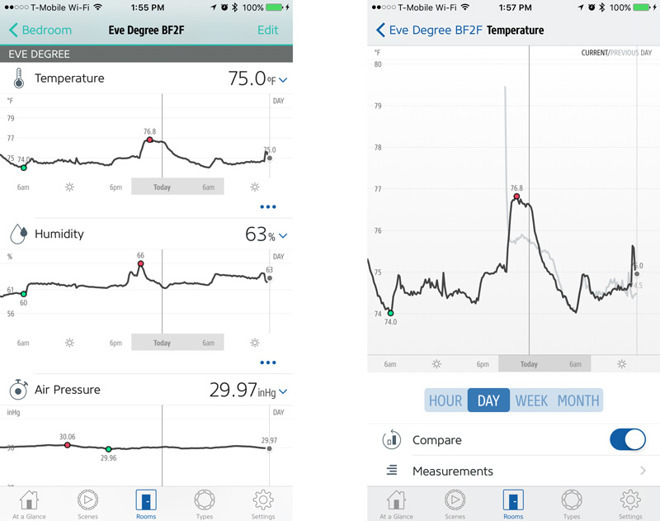 The Eve app can also help pinpoint problems by displaying long-term trends, graphed by day, week, or month. Most people only have a handful of HomeKit accessories if any though, and some of them can make the Degree redundant. Ecobee's latest HomeKit thermostat, for example, already comes with an extra temperature/occupancy sensor, and a two-pack of additional sensors is $79. A single Degree is about $70, and can't detect whether someone is around. The product does have a built-in display, but it's often difficult to read since there's no built-in backlight, and the glass is prone to scuffing and attracting debris. In a lit bedroom we sometimes had to walk over or even pick up the unit to check what the temperature was, if we didn't just resort to Siri or the Home app. Simply turning the Degree away from direct light hurts the display's visibility. There aren't any critical flaws with the Degree, to be clear. We do wish it had a backlight button, and Wi-Fi, but it makes sense to leave those features out. Battery life might plummet otherwise, and owners would probably get upset at having to buy new batteries two or three times a year. If there's an issue with the product, it's just that it only makes sense in a few niche cases —say, if a room has to stay within a set humidity range, there are problem areas in a home's air conditioning, or some clever automation ideas are hinging on temperature. Under those circumstances, we might recommend it. First-time HomeKit buyers should, in any case, explore other options and see if they can find a device which will both monitor conditions and do something about them. The Eve Degree can be pre-ordered directly from Elgato for $69.95, with shipments expected to begin on June 7. Amazon will also be carrying the accessory, although the retailer isn't accepting pre-orders at this time.